Lanzarote is far from falling short of the natural diversity, beauty and uniqueness shared by all the other islands belonging to the Canary Islands Archipelago. The island in itself is a declared UNESCO biosphere reserve, which is a pretty powerful incentive for tourists in search of unspoiled nature. Yet, this is not the only asset with which Lanzarote takes pride in. On the contrary, a great deal of visitors believe that the efficient tourist formula of Lanzarote comes down to a combination of beaches and sun. Indeed, idleness seems to be one of the best ways of spending time in Lanzarote – further enabled by the beach bars, coffee shops and eating venues – but thorough tourists should be aware of the fact that the island is much more than that. The famed volcanic eruption in the 18th century obliterated much of the historic remnants in Lanzarote. Yet, the historic past of the island is not to be disregarded. Lanzarote is said to have been the first island of the Canary Islands Archipelago which was inhabited by man, and there are plenty of references made to this island praising the beauty and the fertility of the place. Herodotus, Plato, Plutarch and Pliny the Elder made such records, and the fact that Lanzarote was alternately visited and dominated by Phoenicians, Romans, Moors and, finally, Spain, proves that the place has been able, all this time, to draw the attention and the interest of such powers. 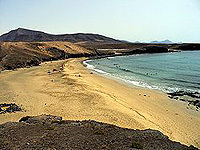 Most of the cities, towns and villages in Lanzarote have developed into successful resorts, since the main economic activity of the island is represented by tourism. By consequence, accommodation solutions are to be found throughout the island. Beachfront hotels are the most popular among tourists, since they offer great views and are in the close proximity of beaches. As a curiosity, Arrecife, the capital city of Lanzarote, has the tallest hotel on the entire island, so one should expect the view not to fall short of the money paid for accommodation. Just as any of the Canary Islands, the gastronomic display of Lanzarote ranges from the ever present traditional Spanish cuisine – tortilla, tapas, paella, kebab – to international cuisine, of which the best represented is English food, given the historic and tourist relations between all of the Canary Islands and England. However, specific Canarian dishes are extremely high thought of by locals and tourists alike. So, the wrinkly potatoes (papas arrugadas) possibly dipped in mojo belong to the must-try category, along with the many pastry specialties made from gofio. The Canary Cetacean Museum, the Ethnographic Museum Tanit, the El Grifo Wine Museum and the Museum of Canarian Emigrants open the tourist objectives picture of Lanzarote, and they are paralleled by the Cesar Manrique Foundation and by the Museum of Contemporary Art. The Monument of the Farmer and El Morador del Rio complement the attractions which appeared as a result of the work of man. Yet, the natural objectives the island is replete with must be ticked off, the most notable being the Water Caverns (Los Jameos del Agua), the Green Caves of Lanzarote (Cueva de los Verdes) and El Golfo (located nearby the homonymous village). The year starts off with two major carnivals, namely, the Arrecife Carnival and the Puerto del Carmen Carnival. The International Jazz Festival, which is an event hosted by the entire archipelago, is also held in Lanzarote. Ironman Lanzarote and the National Day Festival are the most notable secular events. But one should not forget that Lanzarote, just as all the other Canary Islands and the entire Spain, in fact, has a pretty eventful calendar bristling with religious manifestations.